Copyright SO Easy Even a Monkey Can Do It? Monkey see. 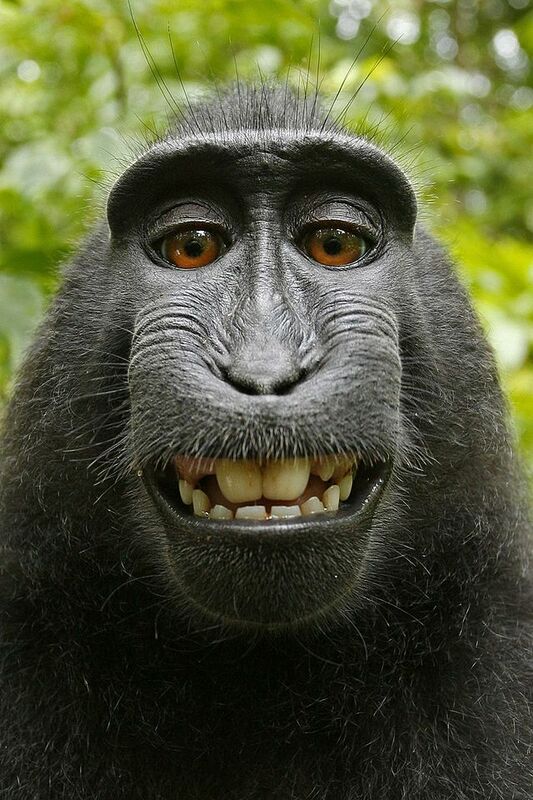 Monkey take a selfie? Then, monkey owns a copyright? That is what British nature photographer David Slater is claiming. When he retrieved his camera from a group of monkeys who decided to play with the device, he found a very good up close and personal photograph taking by the monkey. Slater is claiming copyright ownership in the photo and arguing that it should not be in the public domain. He has not convinced me. Slater is a nature photographer and was in the business of photographing monkeys when the animals became intrigued with the camera. According to the story with CNN, HERE, the monkeys took the cameras and started pressing the shutter button. What resulted is this photo below. Slater is now in dispute with the creative commons website because the photograph was placed on the Wikipedia website for all the world to use. The editors of Wikipedia claim Slater has no ownership in the photo because it was taken by a non-human. The photo is in the public domain. Slater is claiming ownership and saying he has the exclusive rights associated with copyright ownership. For copyright protection to exist the creative work in question must be an original work of authorship fixed in a tangible medium of expression. There is no question that a photograph is a tangible medium of expression. But, can a non-human be an “author,” according to the Copyright Statute? To me, the answer is no. Slater does have an argument he is the owner of the photo because it was taken with his equipment. He also took the time, and risk, to get up close and personal with the monkeys. But for his willing attitude, the photo would not exist. However, the copyright statute does not simply reward effort. As the cases have developed, the owner of a photo is the one who actually presses the shutter. In this case and by Slater’s own admission, the monkey and not Slater pressed the shutter. At this time, the copyright statute only recognizes humans as authors. This makes sense to me. To reach a different conclusion could open up an entire Pandora’s Box where inanimate objects, such as scheduled motion detector cameras, could potentially receive some sort of copyright protection. I am not persuaded this extension of copyright protection to non-human objects was the original intent of copyright law. If Slater had never told anyone how the monkeys took over his equipment, then we would be none the wiser and would assume Slater had pressed the shutter. However, he did let that one little monkey fact out of the barrel. Because of that, he has cost himself a great deal of royalty fees in the future. The best Slater can hope for now is for people to view this photograph and his other works as his willingness to do whatever is necessary to get the shot. It is unlikely his claim for copyright ownership is going to stand. He might not like it, but the photo is in the public domain. For additional reading on the issues of selfies and ownership, be sure to check out an earlier post The Selfie Felt Around the World. What do you think? Should we go down the road of allowing non-humans to hold copyrights? Take part in the Comments section below and Stay Tuned In! What a great post. You illustrate your points so well. Keep this blog going. Well done. Actually, no one unless there is some minimal degree of creativity. Check out my post from this week regarding the release of the Compendium of U.S. Copyright Practice. Sorry, but I disagree. Let’s consider the consequences of this position. If you ask a stranger to take a photo of you and your spouse on vacation, does the stranger own the copyright? Do you have to carry around copyright assignments as you tour Venice? What about wildlife photos taken with infrared triggers or trip wires? Photos taken by security camera? Webcam shots? Pressing the shutter is too narrow a definition of what makes one the creator of the work. Slater, like anyone investing time, money and expertise into a creation, deserves the protection of copyright law. Thank you for your thoughts. While these thoughts are logical it is simply not have the cases have developed. I appreciate you reading and taking part in the conversation.